One outlet provides and exclusive, breaking anti-Trump report, using unnamed anonymous sources, and all the other networks pile on to that story, then cable news networks like CNN and MSNBC gives the report wall-to-wall coverage, screaming impeachment as often as they can......then within 24 hours, the entire story falls apart, is revealed as "fake news." Some of the stories were just silly, like NBC and others claiming President Trump wasn't visiting the troops abroad, as he was in the air to visit the troops abroad. Others were far more serious, such as the CNN fake news story that cause the forced resignation of the reporters responsible, and in the case of Brain Ross of ABC, an unpaid suspension from the network after his fake news tanked the stock market. The problem was so huge that by March 2018, more than three in four Americans, 77 percent, said that major news outlets report "fake news," according to a Monmouth University poll. 42 percent of those respondents believe that "major outlets disseminate misinformation to push a political agenda." 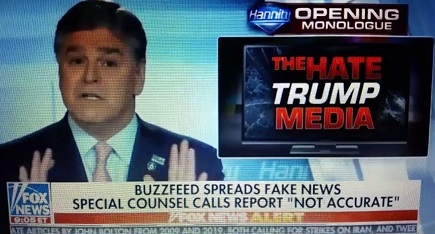 On Friday, January 18, 2019, media outlets online, and television were in a frenzy over a Thursday night Buzzfeed report, using "two unnamed sources" familiar with the Mueller investigation claimed that President Trump had ordered his personal attorney to lie to Congress, with CNN and MSNBC, using the terms Impeach,” “Impeachment,” or “Impeachable," 179 times in less than 24 hours. Then in what is being called an "unprecedented" move, spokesman for the Mueller special counsel office, Peter Carr, a man known by the media as "Mr. No Comment," issued a statement disputing the Buzzfeed report that sent the media into their day-long impeachment frenzy. "Buzzfeed's description of specific statements to the Special Counsel's Office, and characterization of documents and testimony obtained by this office, regarding Michael Cohen's Congressional testimony are not accurate," the short statement read. It didn't take long at all after that for the same media outlets that jumped onto the impeachment frenzy train speculating over the unconfirmed, anonymously sourced, Buzzfeed article to start tearing into Buzzfeed, and in CNN's Chris Coumo's case, angry at Mueller, stating "Mueller didn't do the media any favors tonight, and he did do the president one ... This allows them to say, 'You can't believe it. You can't believe what you read." CNN's Jeffrey Toobin, ignoring the plethora of CNN fake news over the past three years, including pushing this very story from Buzzfeed earlier, said with a straight face "People are going to take from this story is that the news media are a bunch of leftist liars who are dying to get the president, and they're willing to lie to do it...I just think this is a bad day for us." Reminder: CNN mentioned impeachment 82 times on Friday. On a story they admitted they couldn't confirm. Perhaps Toobin and others should just finally admit they are a bunch of "leftist liars" and be done with it. Buzzfeed is standing by their original story, despite Mueller's rebuke, with BuzzFeed editor-in-chief Ben Smith, tweeting "In response to the statement tonight from the Special Counsel's spokesman: We stand by our reporting and the sources who informed it, and we urge the Special Counsel to make clear what he's disputing." Other media outlets trying to backtrack from their day-long fake news push based on Buzzfeed's story, decided the Mueller statement was a good chance to try to repair the damage. Washington Post after the statement from Mueller's office: Mueller's denial, according to people familiar with the matter, aims to make clear that none of those statements in the story are accurate," in reference to the original Buzzfeed story they cited in their earlier reports. New York Times before the Mueller statement: "Trump Lawyer Giuliani Denies the President Told Cohen to Lie," and "BuzzFeed’s Controversial Cohen Story Raises Question: Did Trump Want to Be President?" New York Times after the Mueller statement: "The New York Times has not independently confirmed the BuzzFeed report. One person familiar with Mr. Cohen's testimony to the special counsel's prosecutors said that Mr. Cohen did not state that the president had pressured him to lie to Congress." Beginning to see a pattern? I could provide a multitude of other examples, but I think readers get the point. Media outlets all willingly, and without confirmation, all jumped onto a report that was like a train barreling towards a steel wall, ended up with egg on their face after said train crashed and burned, and are now trying to mitigate the damage they all did, while blaming just Buzzfeed, who may have started the whole fiasco, but certainly didn't force any of them to run with a story they could not verify. WHY DID MUELLER'S OFFICE BREAK PRECEDENT AND ISSUE THE STATEMENT? I am seeing many liberals and journalists ask this question. Why now? Why specifically this report when so many others have been shown to be fake news but Mueller's office never issued a statement on those? I can only think of two reasons why this story forced Robert Mueller's office to respond to a media report. 1) Democrats now control the House of Representatives and were using the Buzzfeed report to irresponsibly suggest more investigations based on the Buzzfeed report, as Democrat House Judiciary Chairman Jerry Nadler wrote on Twitter "Directing a subordinate to lie to Congress is a federal crime," as reported by Politico. California Rep. Adam Schiff, chairman of the House Intelligence Committee, also issued a statement based on the Buzzfeed report, saying "Our committee is already working to secure additional witness testimony and documents related to the Trump Tower Moscow deal and other investigative matters." So, one possibility is that Robert Mueller was trying to prevent Democrats in control of the House from going off the rails over a fake news story. 2) While the other fake news stories over the course of the last three years have had liberals screaming for impeachment, the majority of them, even if they had been true, didn't rise to the level of even loosely being considered as "treason, bribery or other high crimes and misdemeanors," but ordering someone to lie, could be. So, the second possibility of why this story and right now, again stems from Democrats being in control of the House and thinking they had a legitimate basis, because of the nature of the accusation. Had the story been true, then Mueller's office would have had no need to stop the Democrats in Congress from making fools of themselves, and most likely would have welcomed them pursing this matter. As ANP has documented many of these "bombshell reports" that turn out to be "not accurate," aka "fake news," it is not surprising when it happens, but the level of attention this received, following the same exact pattern of all the other examples over the past three years, is astounding, with the writers over at Axios calling this "A reckoning for political journalism," which definitely seems fitting. The liberal establishment medias' collective Trump Derangement Syndrome is creating a national crisis.